Our watches combine luxury along with inspiration from our travels to create a special timepiece unlike anything else, all while paying it forward to those tribes from which we were inspired. Ethnic Watches surpassed its funding goal of $12,347 within the first week of its Kickstarter campaign. Ethnic Watches stands out amongst the competition by using unique textiles inspired by tribes around the world to give the luxury watch industry a new look. Ethnic Watches’ six refined timepieces offer luxury features including Swiss Ronda 762 movement, a Sapphire anti-scratch crystal face, 316L stainless steel, Sony battery, water resistance up to 5 ATM, Italian vegetable tanned leather with hand-cut ethnic textiles and a 10-year warranty. With five different straps that are interchangeable, there is a design to fit every personal style. Upon being inspired by their travels and spending time with different cultures around the world, Ethnic Watches plans to donate 5% of future funds raised to the NGO’s Survival International and Kubuka organizations. 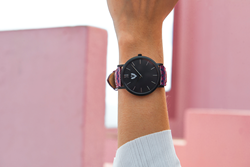 Their hope is to form bonds with many different tribes to make the world a better place for tribal indigenous peoples, while purchasing their tribal textiles for Ethnic Watches. Ethnic Watches are currently available for $168 off of the future retail price for a discounted price of $105 on Kickstarter. To join the Ethnic Watches community or place an order, visit bit.ly/EthnicWatchesKS. Created by two young entrepreneurs with the motto “be your true self,” Ethnic Watches plans to set themselves apart in the watch industry by featuring innovative designs while forming bonds with tribes around the world. Ethnic Watches hopes to increase awareness of indigenous tribes and continue to help preserve their roots. For more information about Ethnic Watches, visit http://www.ethnicwatches.com.